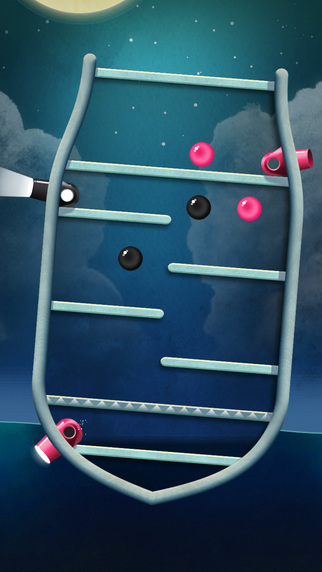 Lachlan Nuttall recently contacted me about his new physics puzzle app game Manowar. First of all, I should confess, I'm not a fan of physics puzzle apps. Too much trial and error. However, Manowar is really outstanding. The objective is to fire all the cannon balls. Any colored ball can use any cannon. However, if the red cannon is used, then all the red balls will jump up to the next level if the floor is shaded with triangles. I almost had to write Lachlan to declare that some levels were impossible. However, a lot of levels have AHA moments. There is a negative: certain levels require very precise nudging. But that's not too bad. At the moment, I've done 30 levels. Manowar costs $1.99. Trust me, this game is fun. Manowar is in the running for a PAGY Award. Nomination revealed on December 30th.